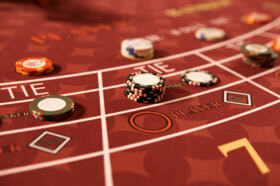 Among each and every table games played in a casino, one of the simplest games to learn is baccarat. Baccarat is completely a game of probability and this game is generally played along with 8 decks of cards. If you know the basic rules, then you can easily play this game and cal also increases your chances of winning. The value of face cards and tens is zero and the aces are counted as one. All the remaining cards are equivalent to their value. The first numeral is dropped if the score is in double figures. The wagers are placed on whether a player or the banker will possess a card with a total value close to nine or whether two hands will be equal or a tie. The banker as well as the player is dealt with two cards each. If the total of the player is five or less then he will be given an extra card. After this the banker will be dealt another card, only if the full value of the banker's hand is lower as compared to the player's total. The number of decks used in a game might be different at different casinos. This is because the rules might vary a bit in different casinos. Cards are generally dealt face down in the casinos that are in Far East. In case a player is given an 8 or a 9 along with the initial two cards, then this kind of hand is known as "natural" and the player who is dealt this type of hand wins the game automatically. If a natural hand is also dealt to the banker, then it will result into a tie and so nobody loses or wins. The hand that wins pays out in the ratio of 1:1. However, a wager on the dealer gets a five percent commission if the hand wins. You should keep this point in mind while you are playing the game of baccarat. If someone places a bet on a tie, then in such condition the payout is in the ratio of 8:1. It is very rare to have a win or a tie and so usually it is not suggested as this can reduce the probability of a win in this game. If you keep these points in mind then you can easily learn the rules of playing the game of Baccarat.